Today's Draw: Nine of Pentacles from the Shadowscapes Tarot. Are your spiritual and material beliefs aligned? Do you see your job as something you do in service to a particular community? Do you treat others the same way at work as you would treat them at church? The Nine of Pentacles is traditionally about prosperity and security. It's about the satisfaction that comes from a job well done. But this particular Nine of Pentacles puts a little different twist on that. It's about working and earning in integrity with your beliefs. As you probably know by now, I work in advertising. I'm the person that writes the words that, hopefully, convince you to buy. A lot of people have negative views about advertising and probably about my job in particular. My father was one of those people. Raised during the depression, he was suspicious of snake oil dealers and the false claims people feel are made in advertising. That said, I've never encountered anyone suggesting that you should bend the truth in my entire career. And I've never written words I didn't believe to be true about the product or service in question. Only once did I ever come upon a situation that made me feel skeevy and we were able to resolve it to the liking of everyone involved. Doing what I do, I get to talk to a lot of company owners, inventors and company presidents. Without exception, these are people who have a passion for what they do and truly believe in what they have to offer. People are out there are on a mission and I get to help them achieve it. But aligning your beliefs with your spirituality is about more than passion. It's about honesty and integrity and what's fair. So the question then becomes, "are you the same person at work that you'd be at church?" I imagine a lot of people compartmentalize their "lives" and justify different tactics in different places. But you're either in integrity to your beliefs or not. As I move toward a second career as an author, my spirituality *is* my career. And with that comes a lot of responsibility that I'm not taking lightly. 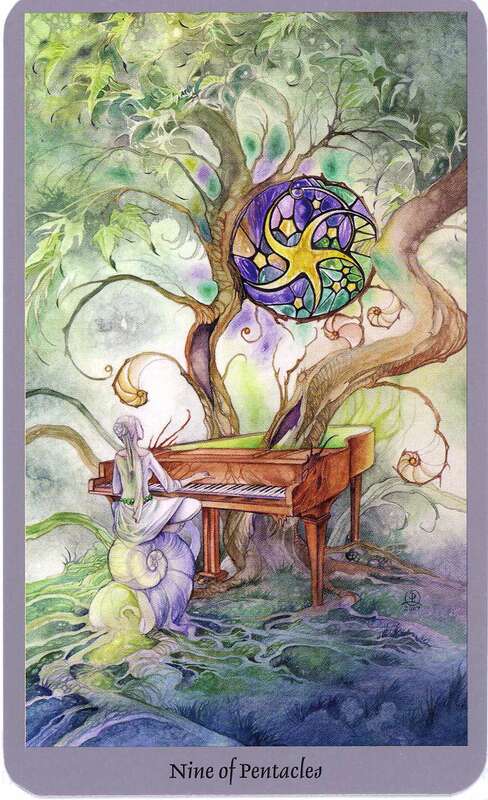 If you look at the woman in the card, she's a musician, but her instrument is as much a part of nature as her soul is. There is no separation between her earth-focused spirituality and her work. She doesn't slip into the "love of money" trap. She doesn't treat those around her with disrespect. In fact, she doesn't work, she serves. All of us serve in one way or another. The question is, are you cognizant of it? Do you approach your job in a way of service? And do you treat it and others as though God were watching...as though God were who you were serving? I'm sure some of you out there are thinking, "what do you want, lady, it's just a job!" To that I would say, "so I take it your answer is a no?" Last week I took people to task about other facets of maintaining your spiritual integrity. And this is another one of those posts where we have to at least ask ourselves if our spirituality encompasses and informs our entire life, or is just for showy talks by the fireplace. This isn't about needing to change jobs, it's about needing to change the way you walk on a 9-5 basis. I didn't always see my job as service. Someone else opened my eyes to that notion many years ago. And seeing it as service completely changed the way I approach it. Yeah, sometimes it makes bitchy or whiny. My spirituality isn't as mature in my job as it is by the fireplace, but it's there and the way I run my business and my business partnerships is very much aligned with my beliefs. In those moments I'm not in alignment, I'm very aware of it and use it as an opportunity to see where I can do better. So just noodle this. That's all I'm saying. I will say that if you can do that one thing...see your work as service...it will change the way you feel about your job and the way you approach others. And before anyone says, "yeah, but you don't know this beyotch I have to work with", keep in mind your spiritual integrity is not dependent on anyone but you. The way you respond is a choice. Sure it's hard. And it's also easy, because the roadmap is laid out before you. You always know the right thing to do.